C. B. McLeod and Co. 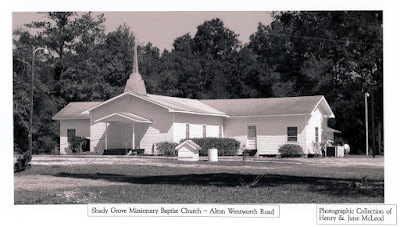 The Shady Grove Baptist Church was duly organized on July 8, 1962. Pastor Claude Crosby was moderator of the council for the purpose of organizing the people into a regular Baptist Church. They petitioned the Taylor Baptist Association for admittance as a cooperation church on October 18, 1962. The church consisted of 22 members at that time. The first two deacons were Brother J. C. Knowles and Brother F. C. Cruce. The first meetings of the church were held in a building off of road 14-A. The church was called Paradise Baptist Church. They met there for six to eight months. Brother Joseph Lyles Sr. was the first acting pastor on Sunday, and Rev. Alva Horton from New Home Baptist Church in Perry was in charge of services on Thursday night. Brother Lyles moved to Georgia and New Home Baptist Church took the church as a mission. The church members asked Rev. T. A. Goodman and Rev. Colin Lewis to preach on Sundays until they could get a pastor. In 1963 land was sought to build a church building. Mr. Reggie Wentworth Sr. gave the church an acre of land. The church paid him 100 dollars for the land. On this land a small building was built. The First Baptist and Burton Baptist Churches donated seats for the church and the choir. There were 37 people present the first Sunday in the new building. The church held its first revival in the new building on April the 1st through the 7th in 1963. Rev. Bobby Dykes from Burton Baptist Church was the guest speaker. Brother Claude Crosby was in charge of the music. The church received 10 new members during the revival. Rev. Claude Crosby became pastor of the church in May of 1963. Sunday School rooms were added to the building a few years later. A fellowship hall was built directly behind the church in 1978 during the time that Rev. Dozier Sapp was pastor. In 1981 a trailer was bought to provide a pastorium for the church. The church holds their annual homecoming reunion on the second Sunday of July. The following deacons have served in the church: F. C. Cruce, J. C. Knowles, Gordon Burgin, L. M. Cruce, Eschol Hendry, K. C. Lawson, Lowery Wentworth, Horace Knowles, and Rev. T. A. Goodman (Honary Deacon). The following 12 pastors have served the church: Claude Crosby – 1963, James Hunter – 1964, Carl Webb – 1965, J. B. Benefield – 1966, Buddy Sadler – 1974, Roy Williams – 1976, Claude Hall – 1976 (interim), Dozier Sapp – 1977, David Smith – 1981, Don Hodges – 1983, Rodney Watts -1985, and Thomas Vickers – 1990. The church has grown from 22 members to 95 members at the present time.